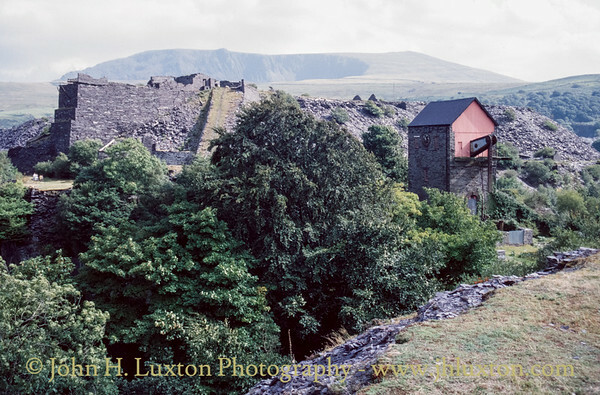 35mm Archive Photographs of sites associated with the Welsh slate industry. Foundations believed to be of an aerial cable way (blondin) engine house. Dorothea Quarry located in the Nantlle Valley commenced working in the early 1820s, By 1848 it had become the principal quarry in the area, employing 200 men and producing 5000 tons of finished slate. Slate production peaked in 1872 at 17442 tons. In the 1930s over 350 men were employed at Dorothea. Production fell after the start of World War II and the quarry closed in 1970. Following closure in 1970 the site flooded and has become a popular, though unofficial, scuba diving location which has resulted in a number of fatalities over the years. The quarry consists of six pits, the deepest dropping 106m from the surface. The slate veins here run vertically, allowing unusually deep vertical pits to be dug. Because the pits fall below the water table they needed to be constantly pumped to stay dry. A Cornish Beam Engine buily by Holman of Camborne, Cornwall was installed in 1904, and is believed to be the most recently built Cornish Beam Engine to be remain in existance. The engine was replaced by electric pumps in 1951, though it was reactivated for a while in 1956. 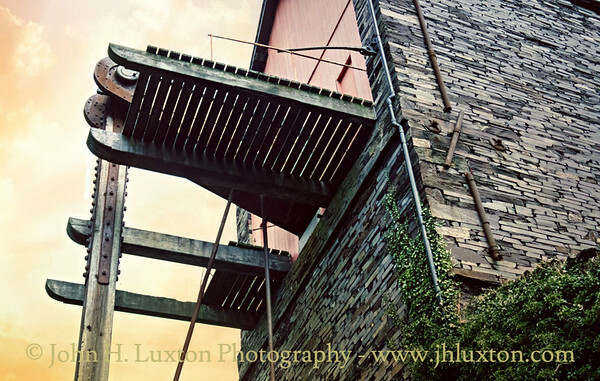 During the 1970s the engine was restored by a company which took its name Dorothea Restorations, however, changing ownership of the site meant that by the 1980s the Cornish Engine House and its engine has been left in limbo and is decaying despite being a grade I listed structure. Dorothea Quarry located in the Nantlle Valley commenced working in the early 1820s, By 1848 it had become the principal quarry in the area, employing 200 men and producing 5000 tons of finished slate. Slate production peaked in 1872 at 17442 tons. In the 1930s over 350 men were employed at Dorothea. Production fell after the start of World War II and the quarry closed in 1970. Following closure in 1970 the site flooded and has become a popular, though unofficial, scuba diving location which has resulted in a number of fatalities over the years. The quarry consists of six pits, the deepest dropping 106m from the surface. The slate veins here run vertically, allowing unusually deep vertical pits to be dug. Because the pits fall below the water table they needed to be constantly pumped to stay dry. A Cornish Beam Engine buily by Holman of Camborne, Cornwall was installed in 1904, and is believed to be the most recently built Cornish Beam Engine to be remain in existance. The engine was replaced by electric pumps in 1951, though it was reactivated for a while in 1956. During the 1970s the engine was restored by a company which took its name Dorothea Restorations, however, changing ownership of the site meant that by the 1980s the Cornish Engine House and its engine has been left in limbo and is decaying despite being a grade I listed structure. Dorothea Quarry Engine House and masonry pyramid support for the chain incline in the back ground. Dorothea Quarry located in the Nantlle Valley commenced working in the early 1820s, By 1848 it had become the principal quarry in the area, employing 200 men and producing 5000 tons of finished slate. Slate production peaked in 1872 at 17442 tons. In the 1930s over 350 men were employed at Dorothea. Production fell after the start of World War II and the quarry closed in 1970. Following closure in 1970 the site flooded and has become a popular, though unofficial, scuba diving location which has resulted in a number of fatalities over the years. The quarry consists of six pits, the deepest dropping 106m from the surface. The slate veins here run vertically, allowing unusually deep vertical pits to be dug. Because the pits fall below the water table they needed to be constantly pumped to stay dry. A Cornish Beam Engine buily by Holman of Camborne, Cornwall was installed in 1904, and is believed to be the most recently built Cornish Beam Engine to be remain in existance. The engine was replaced by electric pumps in 1951, though it was reactivated for a while in 1956. 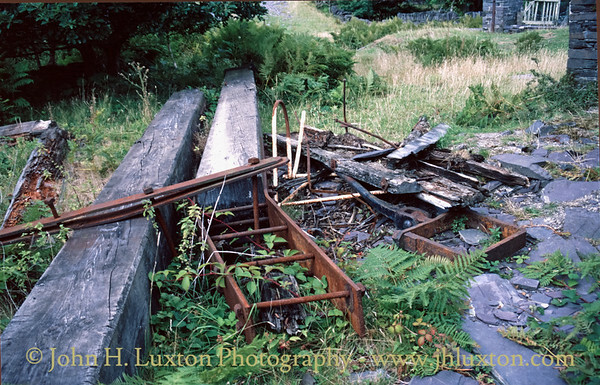 During the 1970s the engine was restored by a company which took its name Dorothea Restorations, however, changing ownership of the site meant that by the 1980s the Cornish Engine House and its engine has been left in limbo and is decaying despite being a grade I listed structure. Rising Main at the top of the pumping shaft. Dorothea Quarry located in the Nantlle Valley commenced working in the early 1820s, By 1848 it had become the principal quarry in the area, employing 200 men and producing 5000 tons of finished slate. Slate production peaked in 1872 at 17442 tons. In the 1930s over 350 men were employed at Dorothea. Production fell after the start of World War II and the quarry closed in 1970. Following closure in 1970 the site flooded and has become a popular, though unofficial, scuba diving location which has resulted in a number of fatalities over the years. The quarry consists of six pits, the deepest dropping 106m from the surface. The slate veins here run vertically, allowing unusually deep vertical pits to be dug. Because the pits fall below the water table they needed to be constantly pumped to stay dry. A Cornish Beam Engine buily by Holman of Camborne, Cornwall was installed in 1904, and is believed to be the most recently built Cornish Beam Engine to be remain in existance. The engine was replaced by electric pumps in 1951, though it was reactivated for a while in 1956. During the 1970s the engine was restored by a company which took its name Dorothea Restorations, however, changing ownership of the site meant that by the 1980s the Cornish Engine House and its engine has been left in limbo and is decaying despite being a grade I listed structure. This looks like the top of the shear legs which was once placed above the pumping shaft. This appears to have been lowered to the ground with some care as the beams are set into the ground so as to support it along with the bar close to the camera. 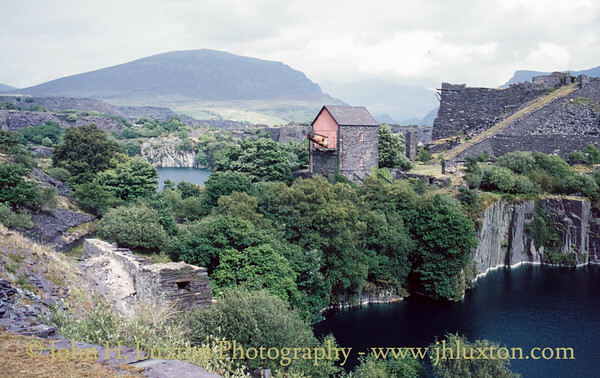 Dorothea Quarry located in the Nantlle Valley commenced working in the early 1820s, By 1848 it had become the principal quarry in the area, employing 200 men and producing 5000 tons of finished slate. Slate production peaked in 1872 at 17442 tons. In the 1930s over 350 men were employed at Dorothea. Production fell after the start of World War II and the quarry closed in 1970. Following closure in 1970 the site flooded and has become a popular, though unofficial, scuba diving location which has resulted in a number of fatalities over the years. The quarry consists of six pits, the deepest dropping 106m from the surface. The slate veins here run vertically, allowing unusually deep vertical pits to be dug. Because the pits fall below the water table they needed to be constantly pumped to stay dry. A Cornish Beam Engine buily by Holman of Camborne, Cornwall was installed in 1904, and is believed to be the most recently built Cornish Beam Engine to be remain in existance. The engine was replaced by electric pumps in 1951, though it was reactivated for a while in 1956. 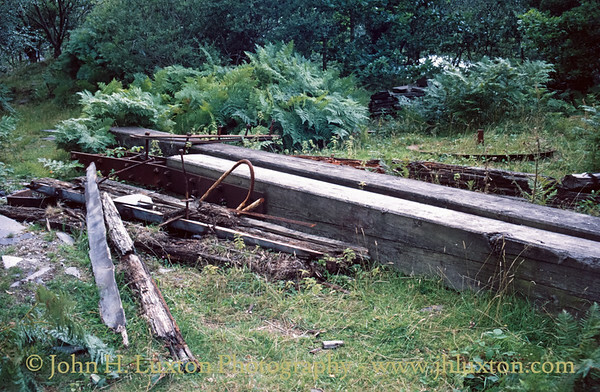 During the 1970s the engine was restored by a company which took its name Dorothea Restorations, however, changing ownership of the site meant that by the 1980s the Cornish Engine House and its engine has been left in limbo and is decaying despite being a grade I listed structure. 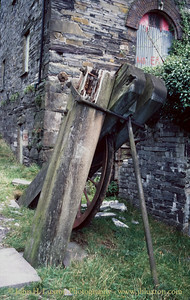 Thus appears to be the remains of a "T bob" or balance bob - a feature of Cornish engine pit work. 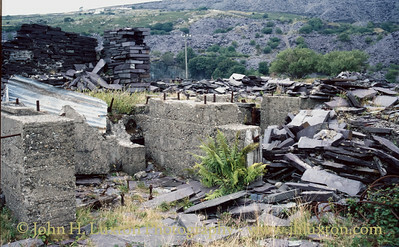 Dorothea Quarry located in the Nantlle Valley commenced working in the early 1820s, By 1848 it had become the principal quarry in the area, employing 200 men and producing 5000 tons of finished slate. Slate production peaked in 1872 at 17442 tons. In the 1930s over 350 men were employed at Dorothea. Production fell after the start of World War II and the quarry closed in 1970. Following closure in 1970 the site flooded and has become a popular, though unofficial, scuba diving location which has resulted in a number of fatalities over the years. The quarry consists of six pits, the deepest dropping 106m from the surface. The slate veins here run vertically, allowing unusually deep vertical pits to be dug. Because the pits fall below the water table they needed to be constantly pumped to stay dry. A Cornish Beam Engine buily by Holman of Camborne, Cornwall was installed in 1904, and is believed to be the most recently built Cornish Beam Engine to be remain in existance. The engine was replaced by electric pumps in 1951, though it was reactivated for a while in 1956. During the 1970s the engine was restored by a company which took its name Dorothea Restorations, however, changing ownership of the site meant that by the 1980s the Cornish Engine House and its engine has been left in limbo and is decaying despite being a grade I listed structure. The Cornish Engine House - note the clock in the side wall. The Phoenix United Mine Prince of Wales engine house near Minions was also fitted with a circular opening for a clock which was not believed to have ever been installed. Interestingly both engine houses and engines were built around the same time. Dorothea Quarry located in the Nantlle Valley commenced working in the early 1820s, By 1848 it had become the principal quarry in the area, employing 200 men and producing 5000 tons of finished slate. Slate production peaked in 1872 at 17442 tons. In the 1930s over 350 men were employed at Dorothea. Production fell after the start of World War II and the quarry closed in 1970. Following closure in 1970 the site flooded and has become a popular, though unofficial, scuba diving location which has resulted in a number of fatalities over the years. The quarry consists of six pits, the deepest dropping 106m from the surface. The slate veins here run vertically, allowing unusually deep vertical pits to be dug. Because the pits fall below the water table they needed to be constantly pumped to stay dry. A Cornish Beam Engine buily by Holman of Camborne, Cornwall was installed in 1904, and is believed to be the most recently built Cornish Beam Engine to be remain in existance. The engine was replaced by electric pumps in 1951, though it was reactivated for a while in 1956. During the 1970s the engine was restored by a company which took its name Dorothea Restorations, however, changing ownership of the site meant that by the 1980s the Cornish Engine House and its engine has been left in limbo and is decaying despite being a grade I listed structure. 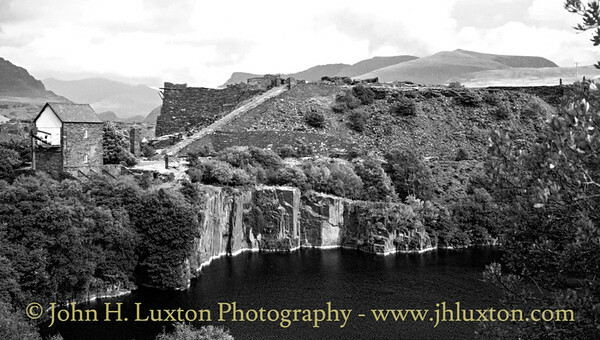 Dorothea Quarry located in the Nantlle Valley commenced working in the early 1820s, By 1848 it had become the principal quarry in the area, employing 200 men and producing 5000 tons of finished slate. Slate production peaked in 1872 at 17442 tons. In the 1930s over 350 men were employed at Dorothea. Production fell after the start of World War II and the quarry closed in 1970. Following closure in 1970 the site flooded and has become a popular, though unofficial, scuba diving location which has resulted in a number of fatalities over the years. The quarry consists of six pits, the deepest dropping 106m from the surface. The slate veins here run vertically, allowing unusually deep vertical pits to be dug. Because the pits fall below the water table they needed to be constantly pumped to stay dry. A Cornish Beam Engine buily by Holman of Camborne, Cornwall was installed in 1904, and is believed to be the most recently built Cornish Beam Engine to be remain in existance. The engine was replaced by electric pumps in 1951, though it was reactivated for a while in 1956. 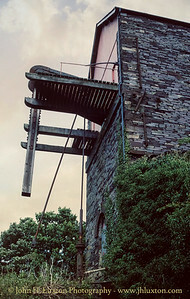 The rising main and top of the pumping shaft. 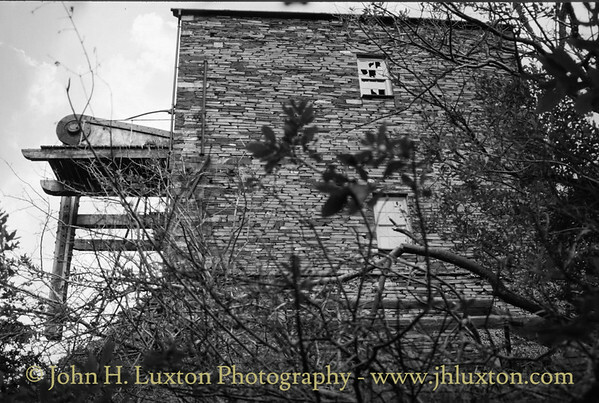 During the 1970s the engine was restored by a company which took its name Dorothea Restorations, however, changing ownership of the site meant that by the 1980s the Cornish Engine House and its engine has been left in limbo and is decaying despite being a grade I listed structure. 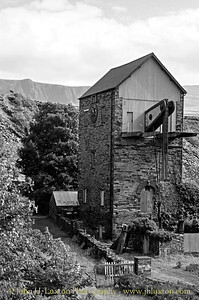 Top of the pumping shaft Dorothea Quarry located in the Nantlle Valley commenced working in the early 1820s, By 1848 it had become the principal quarry in the area, employing 200 men and producing 5000 tons of finished slate. Slate production peaked in 1872 at 17442 tons. In the 1930s over 350 men were employed at Dorothea. Production fell after the start of World War II and the quarry closed in 1970. Following closure in 1970 the site flooded and has become a popular, though unofficial, scuba diving location which has resulted in a number of fatalities over the years. The quarry consists of six pits, the deepest dropping 106m from the surface. The slate veins here run vertically, allowing unusually deep vertical pits to be dug. Because the pits fall below the water table they needed to be constantly pumped to stay dry. A Cornish Beam Engine buily by Holman of Camborne, Cornwall was installed in 1904, and is believed to be the most recently built Cornish Beam Engine to be remain in existance. The engine was replaced by electric pumps in 1951, though it was reactivated for a while in 1956. During the 1970s the engine was restored by a company which took its name Dorothea Restorations, however, changing ownership of the site meant that by the 1980s the Cornish Engine House and its engine has been left in limbo and is decaying despite being a grade I listed structure. 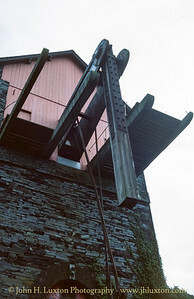 Detail of the severed pump rod and top of the rising main. 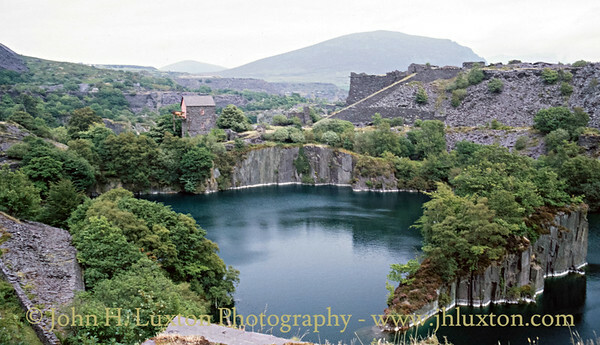 Dorothea Quarry located in the Nantlle Valley commenced working in the early 1820s, By 1848 it had become the principal quarry in the area, employing 200 men and producing 5000 tons of finished slate. Slate production peaked in 1872 at 17442 tons. In the 1930s over 350 men were employed at Dorothea. Production fell after the start of World War II and the quarry closed in 1970. Following closure in 1970 the site flooded and has become a popular, though unofficial, scuba diving location which has resulted in a number of fatalities over the years. The quarry consists of six pits, the deepest dropping 106m from the surface. The slate veins here run vertically, allowing unusually deep vertical pits to be dug. Because the pits fall below the water table they needed to be constantly pumped to stay dry. 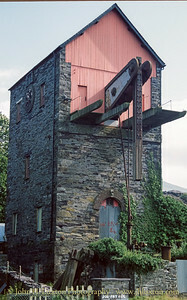 A Cornish Beam Engine buily by Holman of Camborne, Cornwall was installed in 1904, and is believed to be the most recently built Cornish Beam Engine to be remain in existance. The engine was replaced by electric pumps in 1951, though it was reactivated for a while in 1956. 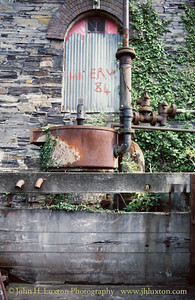 During the 1970s the engine was restored by a company which took its name Dorothea Restorations, however, changing ownership of the site meant that by the 1980s the Cornish Engine House and its engine has been left in limbo and is decaying despite being a grade I listed structure. View up to the bob platform or "bob plat" which gave access to the outer section of beam and the pump rod bearings. Dorothea Quarry located in the Nantlle Valley commenced working in the early 1820s, By 1848 it had become the principal quarry in the area, employing 200 men and producing 5000 tons of finished slate. Slate production peaked in 1872 at 17442 tons. In the 1930s over 350 men were employed at Dorothea. Production fell after the start of World War II and the quarry closed in 1970. Following closure in 1970 the site flooded and has become a popular, though unofficial, scuba diving location which has resulted in a number of fatalities over the years. The quarry consists of six pits, the deepest dropping 106m from the surface. The slate veins here run vertically, allowing unusually deep vertical pits to be dug. Because the pits fall below the water table they needed to be constantly pumped to stay dry. A Cornish Beam Engine buily by Holman of Camborne, Cornwall was installed in 1904, and is believed to be the most recently built Cornish Beam Engine to be remain in existance. The engine was replaced by electric pumps in 1951, though it was reactivated for a while in 1956. During the 1970s the engine was restored by a company which took its name Dorothea Restorations, however, changing ownership of the site meant that by the 1980s the Cornish Engine House and its engine has been left in limbo and is decaying despite being a grade I listed structure. Detail of the severed pump rod. Dorothea Quarry located in the Nantlle Valley commenced working in the early 1820s, By 1848 it had become the principal quarry in the area, employing 200 men and producing 5000 tons of finished slate. Slate production peaked in 1872 at 17442 tons. In the 1930s over 350 men were employed at Dorothea. Production fell after the start of World War II and the quarry closed in 1970. Following closure in 1970 the site flooded and has become a popular, though unofficial, scuba diving location which has resulted in a number of fatalities over the years. The quarry consists of six pits, the deepest dropping 106m from the surface. The slate veins here run vertically, allowing unusually deep vertical pits to be dug. Because the pits fall below the water table they needed to be constantly pumped to stay dry. 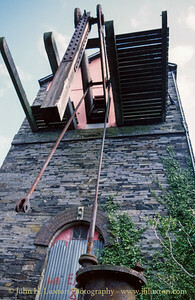 A Cornish Beam Engine buily by Holman of Camborne, Cornwall was installed in 1904, and is believed to be the most recently built Cornish Beam Engine to be remain in existance. The engine was replaced by electric pumps in 1951, though it was reactivated for a while in 1956. 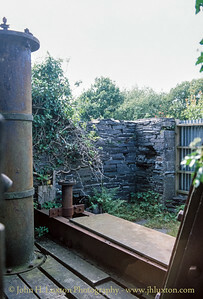 During the 1970s the engine was restored by a company which took its name Dorothea Restorations, however, changing ownership of the site meant that by the 1980s the Cornish Engine House and its engine has been left in limbo and is decaying despite being a grade I listed structure.